A recent survey of CIOs found that over 75% want to develop an overall information strategy in the next three years, yet over 85% are not close to implementing an enterprise-wide content management strategy. Meanwhile, data runs rampant, slows systems, and impacts performance. Hard-copy documents multiply, become damaged, or simply disappear. 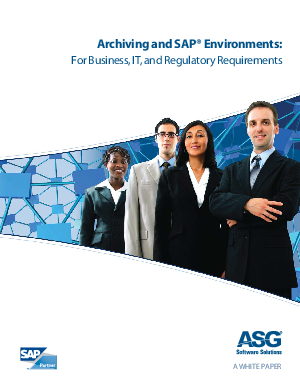 Nevertheless, employees, customers, and business partners continue to demand fast, efficient search and retrieval of information in many forms from across the organization while regulatory requirements compel information retention and lifecycle management. For organizations with SAP deployment some information is in the SAP system; other information is in emails or legacy applications. How can an organization using SAP manage the myriad of content needed to run a successful business? The answer lies in a comprehensive archiving solution that extends the capability of SAP applications, improves system performance, functions as a long-term repository for regulatory compliance, and helps achieve the enterprise integration that is the ultimate goal of your SAP implementation.